When you think of deveining shrimp, your first thought may be that it isn't the most enticing task. Deveining shrimp is very easy to do! While shrimp can be cooked and eaten with or without the vein, most people remove it. This is more for presentation rather than taste, but leaving the vein in can result in a gritty taste when it is bitten into. Just remember, the vein is the digestive tract of the shrimp, so more times than not, you will probably want to remove it. Before you begin to devein your shrimp, you must start by keeping them in a bowl of ice water. This will keep the shrimp fresh while you are working on the others. If you will be using shrimp that have already been shelled, the only thing you will need is a small, thin, sharp knife. A common paring knife will do. Start by holding the shrimp, backside up, and run your knife down the length of the shrimp. This will expose the vein. To remove the vein you can use your finger, or the tip of your knife to pull it out of the shrimp. You may also run the shrimp under a stream of cold water which, in some case, the vein will simply wash away. When finished, replace the shrimp into the ice water to keep it fresh until you are finished deveining and ready to cook. If you plan on cooking your shrimp with the shell still on, you can still devein them. In this case, you will need a shrimp deveiner, a knife-like kitchen tool made specifically for deveining shrimp with their shells on. This can be purchased at any kitchen supply store. Start by holding the shrimp backside up, and place the deveiner under the tip of the shell. Gently slide the deveiner up the back of the shrimp, towards the tail. 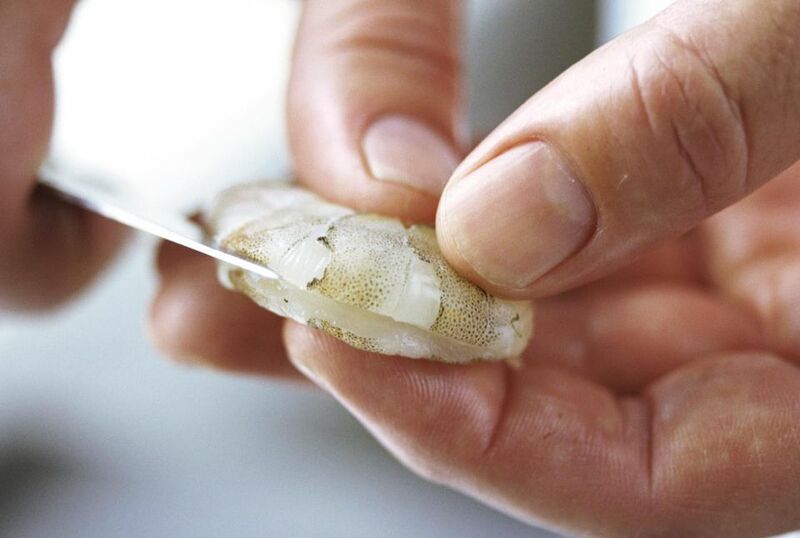 The deveiner has a serrated edge that the vein will adhere to while cutting the shell with its sharp, upper edge.